I have recently discovered the powerful ESP8266-based development boards. These boards have built-in WiFi connectivity and many GPIOs, low consumption and can be programmed in many different ways. In this article I will show how to build a smart button that sends a message to a Slack channel, using a Wemos D1 mini pro. This board can be programmed in many different ways. In this article, I will show how to do it using the Arduino-compatible programming interface. To make it really easy, we will use the PlatformIO command line utility. I will suppose that you have it installed and you are able to run the platformio command. 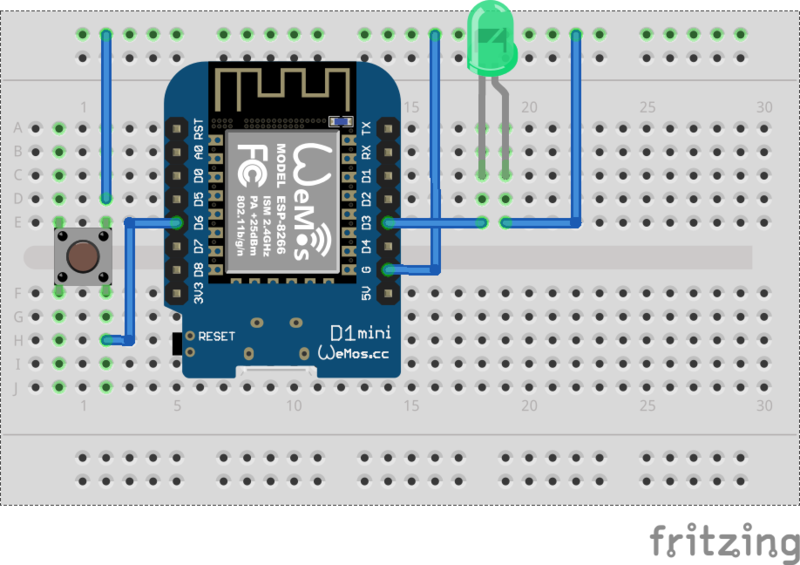 The idea of the circuit is that, when someone pushes the button, the board will make an HTTP POST to the Slack API, writing a message in some Slack channel, and giving visual feedback of the success lighting a LED. This could be used, for example, to make a broadcast notification of any event, such an alarm, that can be triggered easily without having to use any other device. The Wemos D1 must be powered, for instance, via a USB charger or external battery. We don’t need to put a resistor in a serial connection with the LED because we will be using the INPUT_PULLUP built-in resistor of the pin that will drive the current to the LED. After that, you can unplug the USB, and upload the code using the same platformio run -t upload command.